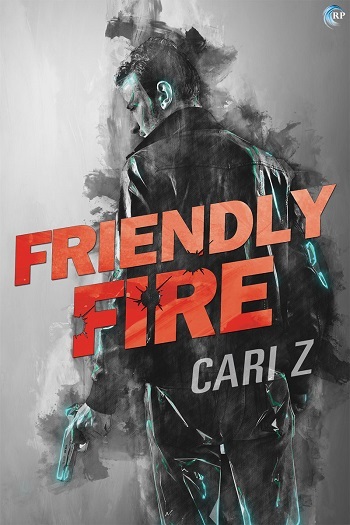 Wicked Reads: Friendly Fire by Cari Z. In a battle of wills, stubbornness could cost you your life. Elliot McKenzie is the king of reinvention. Five years after losing his job and his lover and almost going to prison, his self-help program, Charmed Life, is more successful than he’d ever dreamed. He thinks he’s put his sordid past firmly behind him, until he starts receiving cryptic threats...and realizes it might not be as over as he’d hoped. Lennox is a tough, no crap taking, ex-military family man. Despite being a family man, he's struggling with how to connect with his teenage daughter, Lee. I love that you get to see the rough side of him – the side that makes him great at protecting people, but you also get to see his more vulnerable side – the side where he's unsure of himself. I think that those sides complement each other well and make Lennox's character much easier to relate to. Then you have Elliot. He seems to have a fairly good head on his shoulders and was simply in the wrong firm at the time. While I don't believe he could have stopped his past, his past is what made him who he is today. I love that he was so willing to see where things went with Lennox. The mystery aspect of this case was not entirely hidden, but I did like how it unfolded. Despite having guessed the culprit, I think that the author did a great job developing it and having it come to a climax. I did find the short snippets at the beginning of each chapter somewhat puzzling – I don't think they were necessary, and sometimes, I was just plain confused as to what they offered. Otherwise, I think this was a successful story of protector and protectee becoming more than that. This is an exciting romantic suspense story. Elliot and Lennox are an unlikely couple, but somehow the earnest army veteran and the glamourous life coach are perfectly suited for each other. Elliot is a fascinating, morally ambiguous character and I loved watching Lennox attempt to get past the smoke and mirrors that protect Elliot’s shady past. The contrast between Lennox’s competence and Elliot’s affluence makes the relationship more complicated, as does Lennox’s extended family and Elliot’s child-free isolation. There is little emotional intimacy in this story and I’m not sure how much of the somewhat cool and pragmatic relationship is deliberate. Lennox is a veteran suffering from PTSD and Elliot is full of secrets. I’m pretty sure these two men wouldn’t naturally enjoy a touchy-feely relationship heavy on sharing, but the absence of an emotional connection was less than satisfying for me as a romance reader. I enjoyed the varied elements of this story. Alongside the stalker storyline is the story of Lennox coming out to his family and managing his relationship with his daughter while suffering from PTSD. The stalker story is exciting. I guessed part of it early in the book, but I didn’t guess it all and I loved the action scenes at the end. The tension and suspense builds brilliantly through the story. I really enjoyed this book, though I would have liked a little bit more intimacy between our two leading men. This is a good solid story, which had a good plot, interesting characters, and a clever twist. At times I felt there could have been less every day detail. I was impatient to know where the story was going, but then got too much info about generalities. I really liked the way that the chapters started, worked at reminding us just what separated the men, as well as then showing us what was bringing them together. I would happily have had more insight into their emotions, rather than their actions, but those were solid evidence that they were good. Elliot has an interesting past to say the least and is a fascinating reinvention of himself. Lennox is finding civilian life difficult, but they make a good pairing. I think that this mystery and MM romance is well worth a read. Reviewers on the Wicked Reads Review Team were provided a free copy of Friendly Fire by Cari Z. to read and review.